PETRIN HILL overlooks the city of Prague. You arrive there via a steep funicular railway that starts at Ujezd and if you take the route through the ornate gardens, you find one of the monuments to a past political regime, the grey and imposing Strahov stadium. 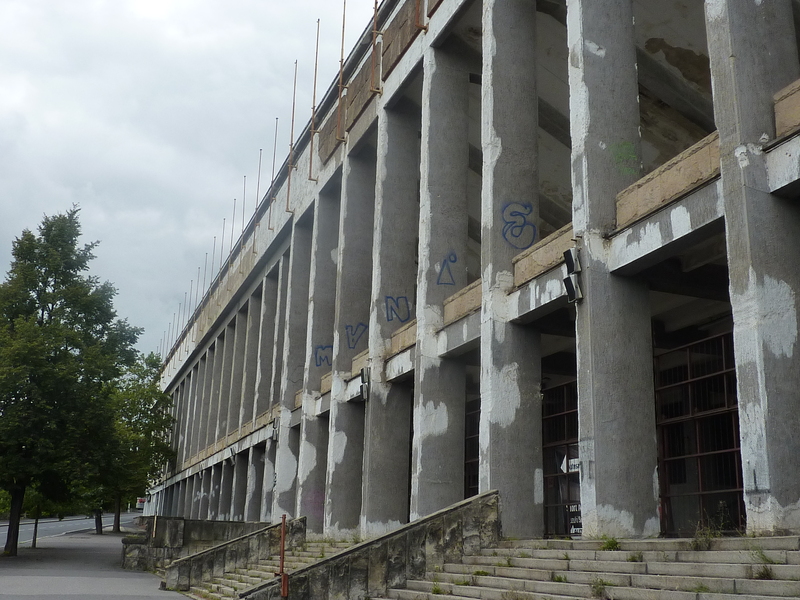 Strahov is a crumbling reminder of how Soviet-style governments liked to build vast socialist superbowls that held huge numbers of people. Behind the “iron curtain”, such stadiums existed to stage events that underlined the strength, good order and health of the nation. 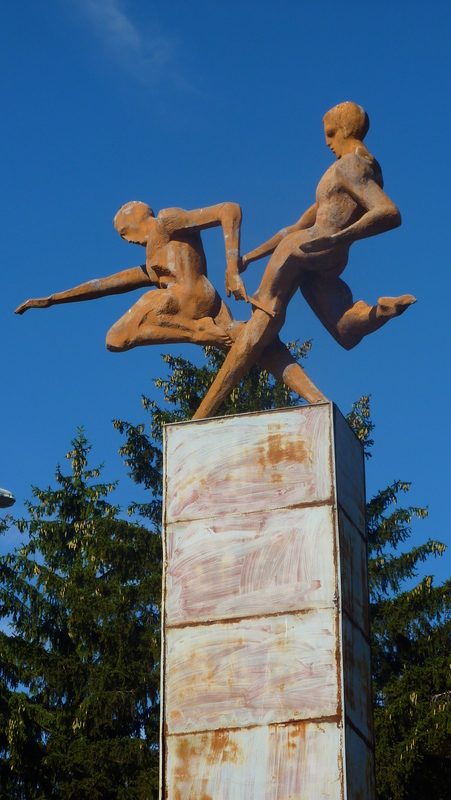 In the case of Strahov, it was built primarily for physical exercise, Czechoslavakia’s own brand of nationalist gymnastics known as Sokol. This started many years before the second world war, but the emphasis placed on it in the post-war years was meant to counter similar movements that once existed in fascist countries such as Germany. Strahov is something of a monstrosity. It’s ugly but you cannot fail to be impressed by its sheer size. At its peak, it held 250,000 people and was regarded as the biggest stadium in the world. It’s all pock-marked concrete and rusting metal today, covered in graffiti, but the structure is still largely intact. There’s an air of dereliction about it, even though Sparta Prague have their headquarters there and use it as a training centre, which suggests the playing surfaces are in reasonable shape. Originally built in 1926, it was redesigned in the socialist “realist” style in the early 1950s. In 1955, for the annual Spartakiade, an event devoted to gymnastics, the organisers decided to paint the sand green. If there was an attempt at deception, it failed, for the paint was of such a low quality that the gymnasts suffered heavy staining to their skin. But the Spartakiade, with the involvement of children, ribbons and flowers, was extremely popular, especially amongst women, as it provided an antidote to the greyness of life in eastern bloc Czechoslavakia. As one observer said, “The entire country dance here…a vibrant forest of hands bound by an oath”. In 1985, some 6,000 hectolitres of beer was consumed at the Spartakiade. But Strahov also has a dark side to it. After the German occupation ended in 1945, the Revolutionary Guard herded some 10,000 people into Strahov and forced German civilians to run across the stadium against a hail of bullets. In fact, hundreds died from torture and execution. It’s certainly not the only stadium with a murky past, though. 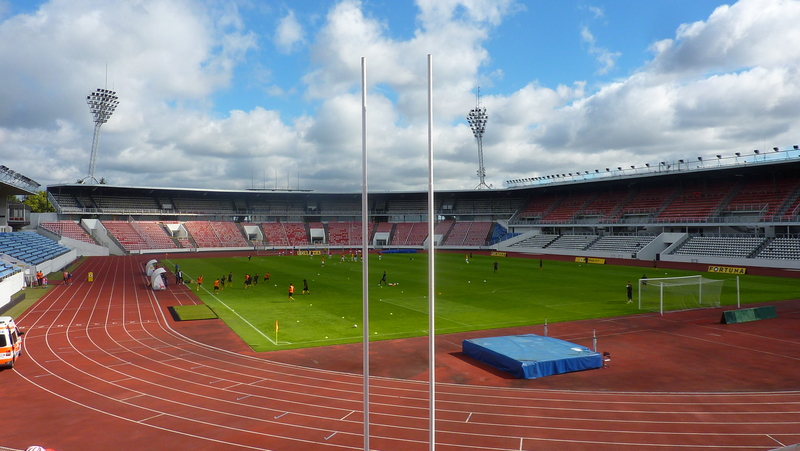 Next door is another sporting venue, the Stadion Evžena Rošického, which is also often referrred to as Strahov. It is now named after a Czech athlete who was killed by the Nazis in 1942. It holds around 20,000 people now and has been used by various clubs in need of a temporary home, the latest being FK Olimpia Praha, who have shifted to the capital from Hradec Králové because their own home was not up to senior football. For some reason, Olimpia play their second division home games at 10.15am. It’s a slightly surreal experience attending one of their games, with nobody walking the streets around the stadium and a slightly eerie Strahov just 100 metres away. The only sound on a bright Saturday morning came from a group of approaching Viktoria Zizkov supporters who were walking up the hill, probably from the funicular. In total, about 50 fans from the other side of Prague had made the short journey and despite the early kick-off, they appear to have been enjoying some of that fine Czech beer. They were boisterous and eyed cautiously by the gaggle of policemen in attendance. But it was just noise. The teams came out and waved to the crowd, turning to face each side of the ground, where absolutely no people were sitting. The gate was just over 800. Olimpia scored two good goals, but the game ended 2-2, maintaining both teams’ unbeaten record. It was an interesting experience, but the most remarkable thing about this trip up one of the many hills around the city was the sight of that huge edifice. How long will it remain sitting in an area that is obviously ripe for development?